WASHINGTON (Reuters) - The United States will soon begin returning individuals who illegally cross the U.S. southern border back to Mexico to wait there while their immigration cases proceed, U.S. Homeland Security Secretary Kirstjen Nielsen said on Thursday. The policy change is part of the Trump administration's efforts to tighten U.S. immigration laws to let in fewer immigrants seeking to enter both legally and illegally. 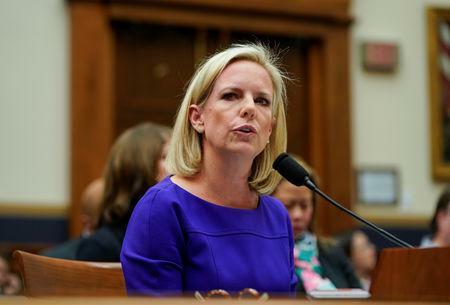 "Aliens trying to game the system to get into our country illegally will no longer be able to disappear into the United States, where many skip their court dates," Nielsen said in a statement. "Instead, they will wait for an immigration court decision while they are in Mexico."